Ever since I read this CF post on paintbrush and paint splatter prints, I can’t seem to get this spring trend out of my head. The trend reminds me of the work of American painter Jackson Pollock, an abstract expressionist artist. He created drip “action” paintings that weren’t meant to showcase artistic skill, but rather the movement, process, and creation of the artwork. I decided to pay homage to Pollock with my own DIY project, but naturally, I also added in my own twist. I know how tricky it is to try a trend; you’re often stuck between wanting to be on the cutting edge of fashion and not wanting to look silly. 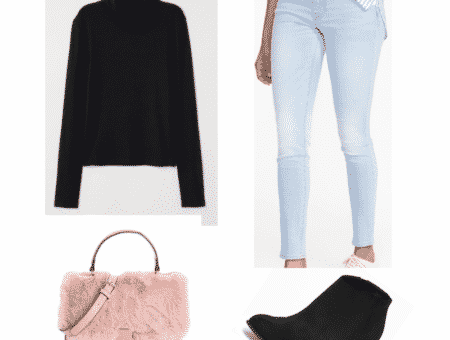 I’ve always found that a great way to try a trend is in limited quantities, which can usually be done with accessories! 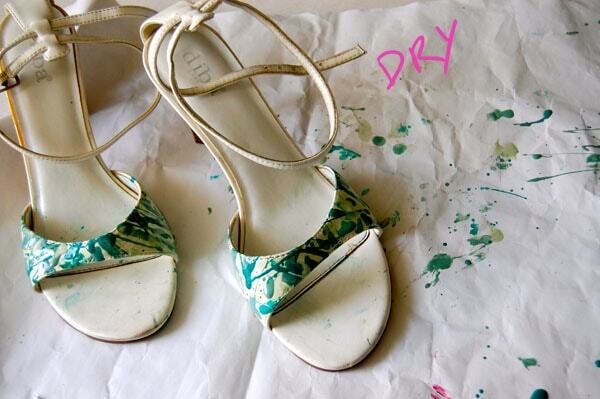 So for this DIY tutorial, I opted to create a pair of paint splattered shoes, as it’s such a simple (and cute!) way to ease into the trend. I also wanted to share a trick from the jewelry DIY world: use nail polish to paint on colors. Nail polish works wonderfully here: there’s a wide range of color options, it’s inexpensive, and it’s easy to clean up if your DIY does not go as planned. The best part? You can use the polishes again and again! 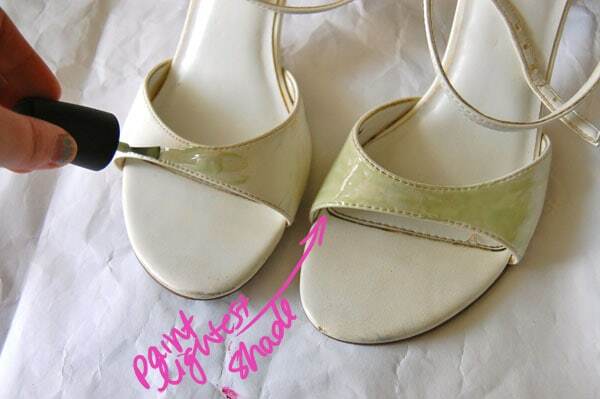 Plain white heels (or flats, sandals, sneakers, etc. – it’s up to you! They just have to be white, since it forms a good “primer” foundation for your colors!) – I used strappy heels but this would work even better on a pair with more surface area. Paint the area you want to cover with your lightest nail polish shade. Paint a design over this. It’s best to be spontaneous and random, but I’m going to outline three different techniques for painting your design. Dunk the brush into the nail polish. Hover it above a spot and gravity will create nice drops! Hold the nail polish bottle sideways. 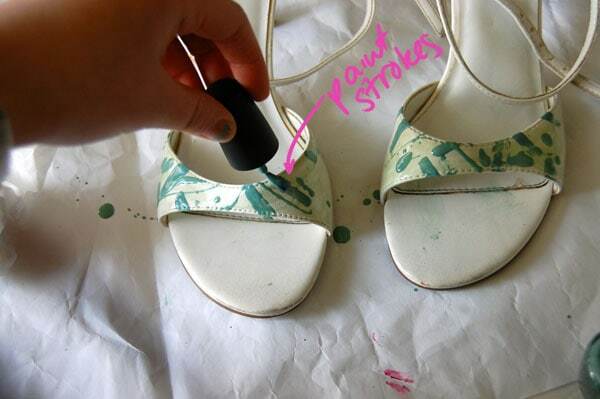 Stick the brush into the bottle, and with a flicking motion, quickly pull the paint from the bottle onto the shoe and drizzle lines of color. The easiest technique is to simply “paint” on brush strokes. To get the best “stroke” style, be sure to rid of excess nail polish by wiping the brush off on the mouth of the bottle. However, don’t stick to one technique per color – mix it up! And most importantly, randomly incorporate the different techniques and colors so they “layer” on top of each other for the best effect. After you have your design, use tissues and nail polish remover to get rid of any paint that falls outside the area you want to cover. I decided to wear my heels with a similarly-colored jagged hem maxi. I love the sort-of garden party feel of my ensemble. It’s perfect for spring! Would you try your hand at DIY-ing paintbrush prints using this tutorial? 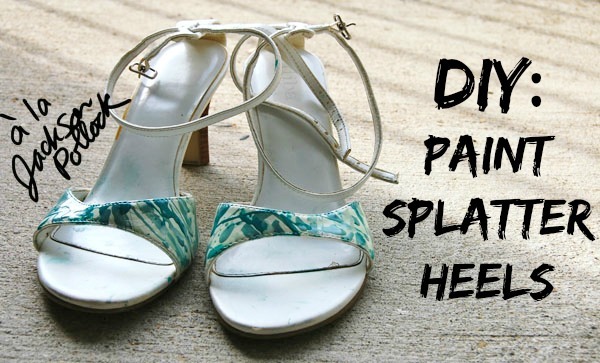 What types of DIYs do you like – clothing, jewelry, shoes, upcycling? 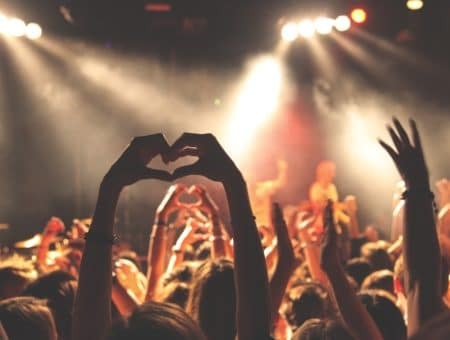 Are there any other DIYs you would like to see the tutorials for? Let me know in the comments!